The Chrysler Group announced this past weekend that their Trenton Michigan Engine Assembly Plant had built the 1,000,000th example of the powerful 3.6L Pentastar V6 - just 18 months from when this new engine was formally introduced to the American auto industry. Across that expansive lineup of vehicles, the Pentastar offers an impressive range of power outputs with the “least powerful” being the 283 horsepower front wheel drive applications like those found in the Dodge Avenger and Chrysler 200, while the sport utility vehicle versions in the Jeep and Dodge Durango offer 290 horsepower and the rear wheel drive applications in the Dodge Charger and Chrysler 300 offer 292 horsepower. The most powerful application of the 3.6L Pentastar V6 is that found in the Dodge Challenger, which packs an impressive 305 horsepower for entry level muscle car buyers (shown on the right). Also, thanks to the vast advances in engine technology, the Pentastar V6 has also proven itself to be far more efficient than the plethora of engines which it replaced. The wide variety of uses across the Chrysler Group lineup garnered enough attention for the Pentastar V6 to earn a spot in Ward’s Ten Best Engines for 2011. Also, the Chrysler Group isn’t done with the Pentastar yet as there have been reports that the popular Ram 1500 lineup will soon feature the 3.6L Pentastar as the entry level engine and there are rumors that there are more versions of the Pentastar coming in the future – packing more displacement and possibly forced induction. I have had a chance to speak with an employee with the Chrysler Group who is close to the Pentastar program (who obviously asked to remain anonymous), who explained to me that in the last year, she has seen an incredible amount of testing done on the Pentastar engine platform. 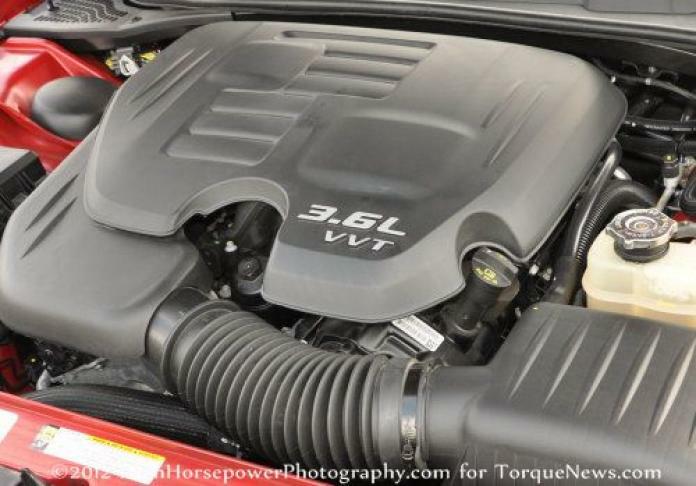 These tests included application with superchargers, single turbochargers and twin turbocharger setups with power outputs that “will blow away Ford’s V6 EcoBoost”. For those who aren’t sure, the EcoBoost V6 in the Ford Taurus SHO makes 365 horsepower and 350lb-ft of torque while the EcoBoost F150 makes the same 365hp but offers a class leading 420lb-ft of torque. Considering that Chrysler has gotten 305 horsepower out of a naturally aspirated Pentastar V6 in the Dodge Challenger, a twin turbo design (similar to that found in the EcoBoost V6) should not have any problem eclipsing the power output of the popular Ford V6. Ford has displayed very clearly that the American consumer has no qualms about buying a pickup truck with a powerful and efficient twin turbocharged V6 so it will be interesting to see if the Chrysler Group uses the Pentastar and a pair of turbos to counter Ford’s EcoBoost success…or if we will see forced induction versions of the Pentastar popping up in other vehicles in the coming years.